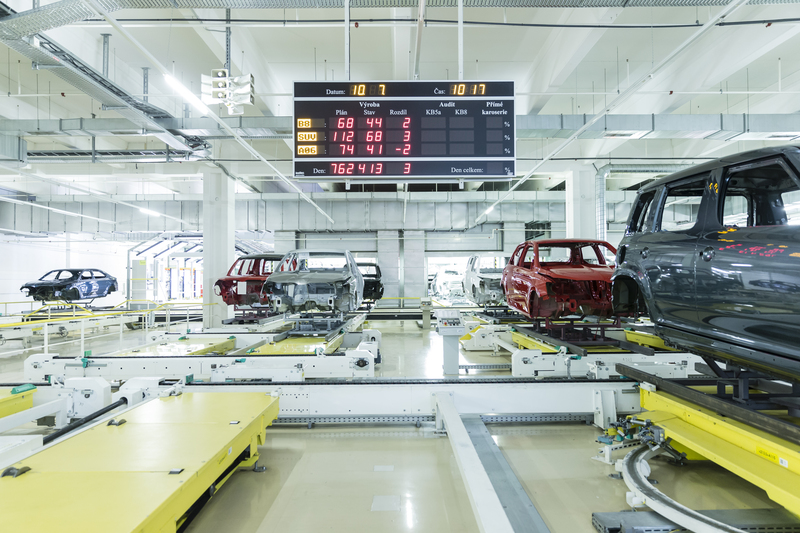 Everything in sync: if you want to feel the drive behind a brand, you’ve got to see where the cars are made. A visit to the ŠKODA plant in Kvasiny, where every ŠKODA Superb makes its first outing. 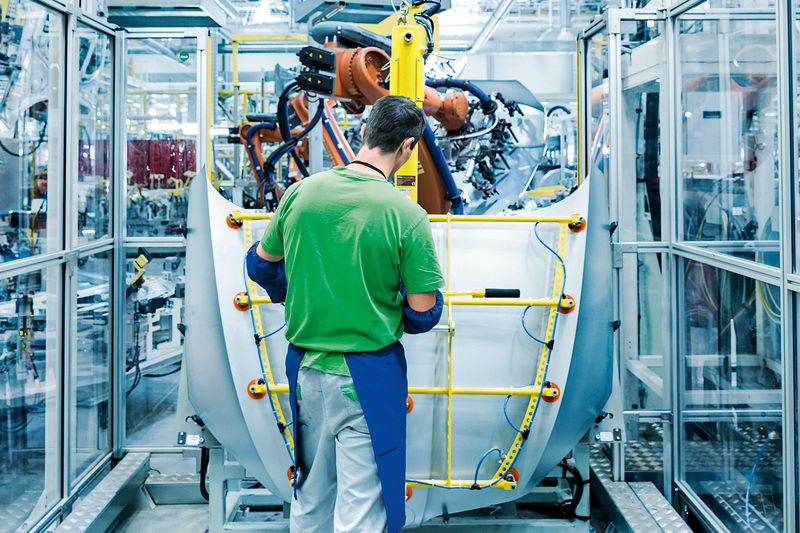 assembly process at the production plant in Kvasiny. Not only has the appearance of the car changed, but also its home; large parts of the plant have acquired some major new elements. Cars have been made in Kvasiny, a town about 160 kilometres from Prague and on the edge of the Orlické Mountains, for more than 80 years. The mountains are part of the range that forms the border with Poland. Velká Deštná, the highest peak, stands 1,115 metres tall. Rich in castles, fortresses and forests, the area is known for sustainable tourism. It is an ideal place for hikers, and in winter for cross-country skiers. THE NEW SUPERB HAS CHANGED EVERYTHING. IT’S LIKE AN AWAKENING FOR US. 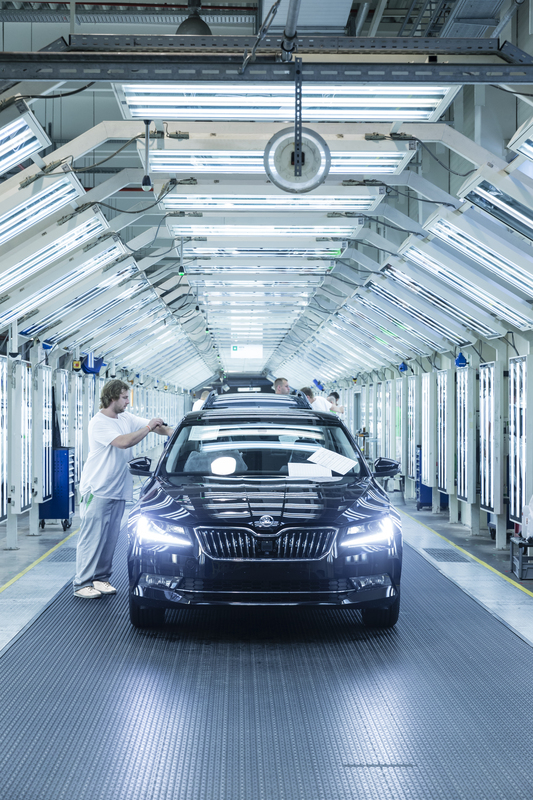 ŠKODA’s success and growth are reflected in the development plan for the plant on the gentle foothills of the Orlické Mountains, also known as the ‘eagle mountains’ – and the town’s coat of arms features that proud master of the skies. Historical records mention the place for the first time in 1544, and its castle was the main attraction until the arrival of the carmaker. 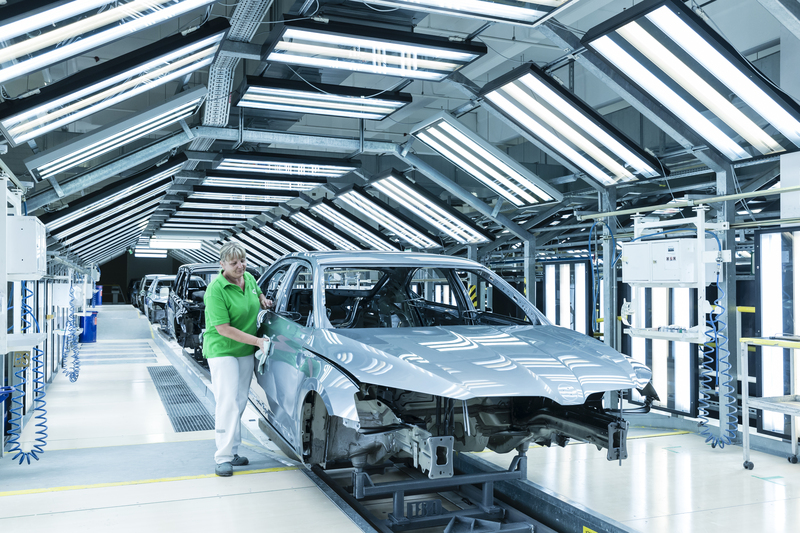 Kvasiny currently has a population of around 1,500, although the ŠKODA plant employs more than four times that number. Cars have been built here for over 80 years, originally under the brand name of Jawa, while the first Superb type saw the light of day in 1947. The site has produced over 1.5 million cars in total, and now occupies ten times the area enclosed by the original factory walls. The milestones in this expansion process are marked by the Superb model series (see info box). “Kvasiny is a plant that lives,” says Robert Pek, who has experienced the changes that have occurred since the turn of the millennium first-hand. As an interpreter, he accompanied the new plant director back then during construction. Today he describes the atmosphere like this, “We are living the new age of ŠKODA here. And our family of employees is getting bigger all the time.” While a lot has changed in terms of appearance, the inner values have remained the same. The site has a tradition of manual work in the production of cars, although electric hands are now taking over some of the dirty and heavy work. There are many areas in the plant where one can find such logical and symbolic helping hands between the past and the future. 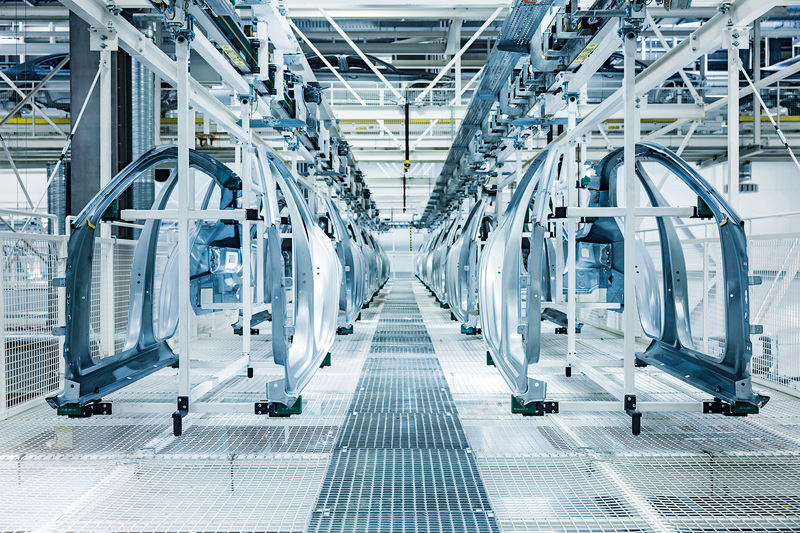 In pairs and as if by magic: car body parts are on the right route to assembly at just the right time. 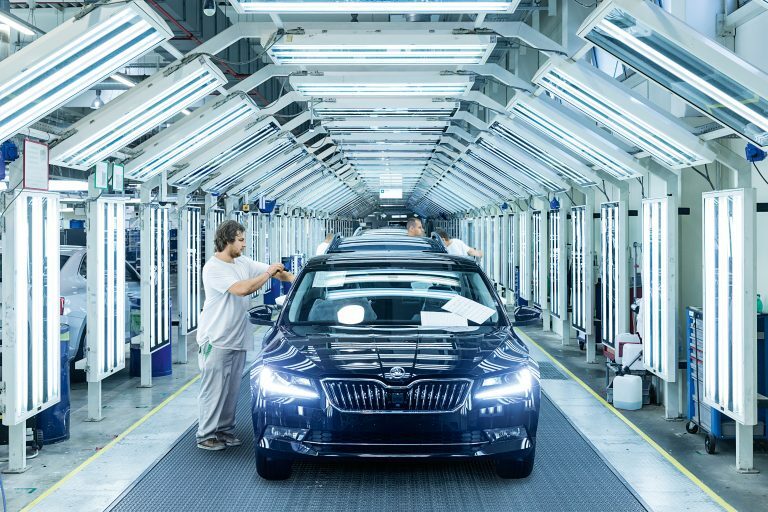 WE ARE LIVING THE NEW AGE OF ŠKODA AT THE KVASINY PLANT. The part of the future that paint specialist Karel Macháček is currently working on goes by the name of Samoa and is a very special hue of metallic red. “As far as technology goes, it’s a complicated application,” says Macháček, “but we like these types of challenges.” A new paint colour called Business Grey came along with the new Superb. Pavel Mizera, who bears overall responsibility for the paint process, knows that a wealth of experience goes hand in hand with high quality. On the new Superb, even the fuel caps are painted in Kvasiny. They were the last blank spot on the paint map. Mizera gazes out over a row of car bodies in gleaming matte gold that glide into an application cage for a special stage of their treatment. 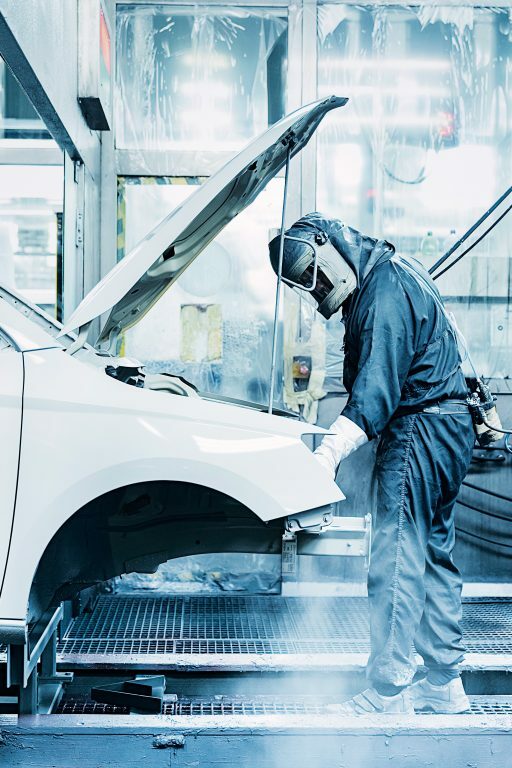 There, a descending spray of mist will wash away the last specks of dust, after which the car bodies – already recognisable as Superbs – will be gently stroked with brushes made of emu feathers in order to prevent the build-up of electrostatic charge. The doors are opened by employees in white coats, who call what they do an “operation”. After all, why shouldn’t wellness treatments also extend to cars? TECHNICAL CHALLENGES? WE LIKE THEM HERE. Petr Barták (34) from Nové Město nad Metují is an operator in engine pre- assembly. 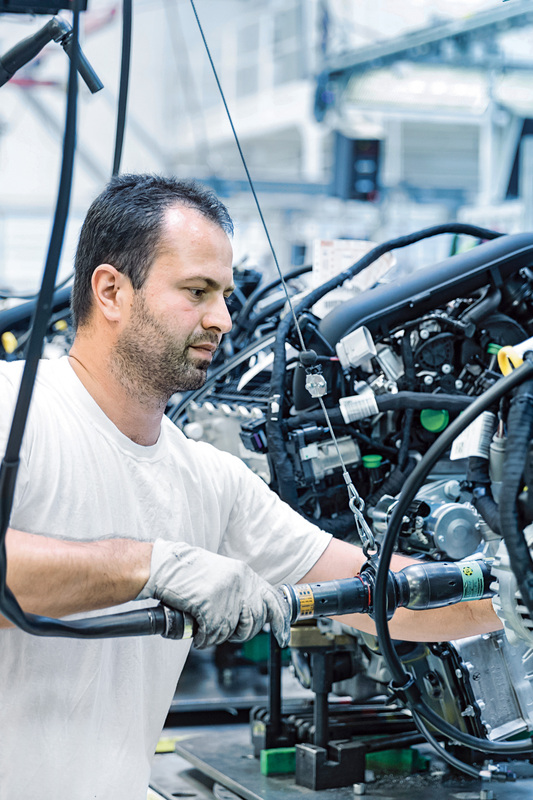 He has been at ŠKODA for eight years. For him, “speed, quality, precision and reliability” are what makes working for the brand so special. 2015 was a year of growth for the Kvasiny plant. PRODUCTION IS ALL ABOUT SPEED, QUALITY, PRECISION AND RELIABILITY. 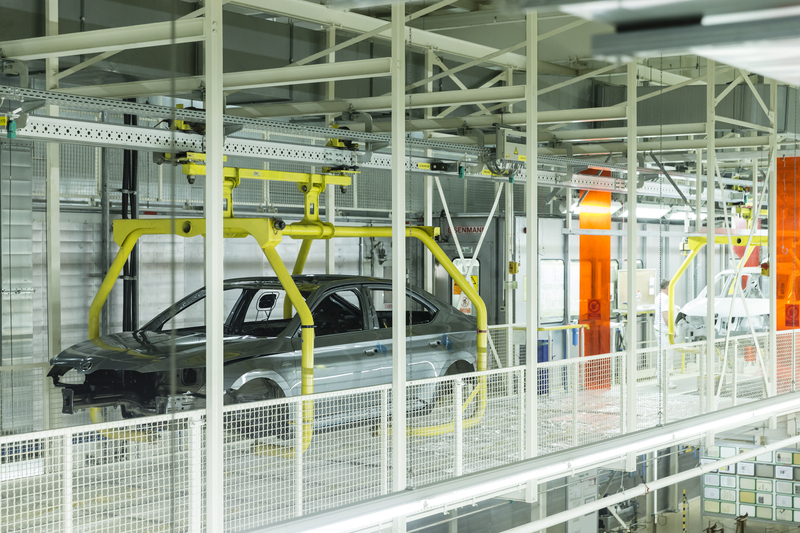 Including all the priming and drying stages, the conveyor lines in the paint shop cover more than seven kilometres. Those in body production are shorter. That said, the new production hall is enormous. Measuring just over 100,000 square metres, like a huge construction kit. On the Superb’s first outing in its automotive life, it is lifted, pushed, trimmed and caressed. But its genes first need a robust foundation – so the wheel well, front end and longitudinal beams are welded to its underbody. Visitors are immediately struck by how quiet and orderly it is in this enormous hall. The production lines have been restructured and expanded. It is very easy to follow the creation process of the Superb. In the middle of the body shop, robots act out fascinating choreography as they enclose, lift, turn and work on the Superb. 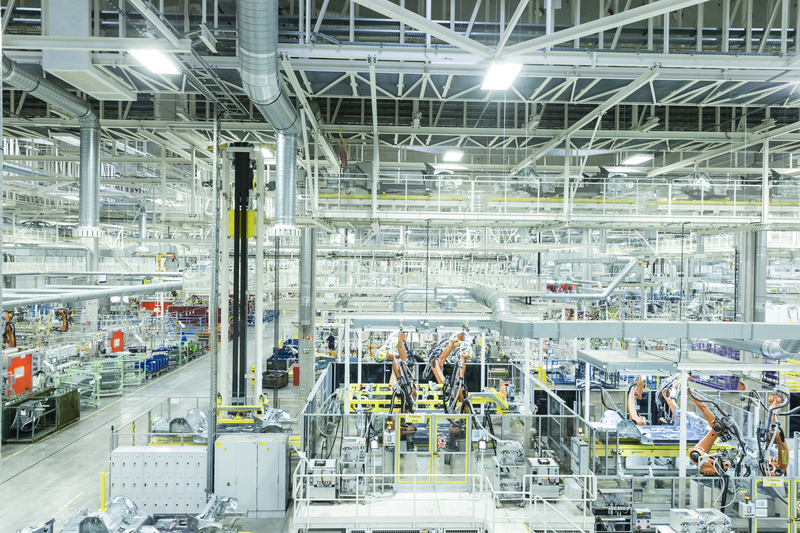 From the left and right sides of the hall, workers manually feed preassembled components into the core line’s automated processes. At any given time, 58 cars are on the line, with “assembly” signs at individual stations. Considering production as a holistic process, it is more an awakening. The new Superb required the introduction of new equipment and tools, and a new logistics hall has been built. The body, whose silhouette now clearly reveals it to be the Superb, takes an undulating course through the hall, often suspended just below the high ceiling. There’s no question that the people in Kvasiny have the energy required. 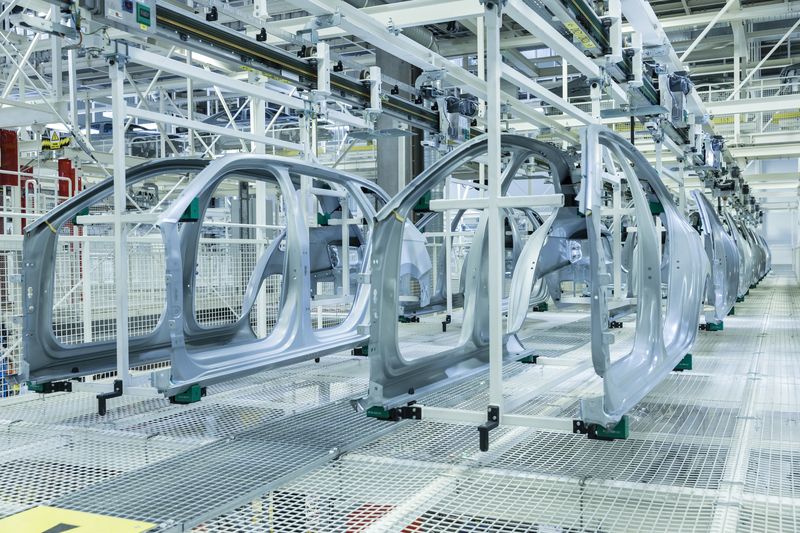 from the parts to the whole: HOW A ŠKODA IS MADE In barely 24 hours from individual parts to a ready-to-drive passenger car – to witness the making of an automobile is always fascinating. 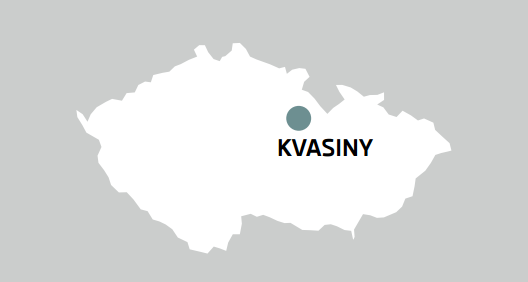 A close look at production in Kvasiny. Manual tasks performed by experienced experts go hand in hand with automated processes in production. 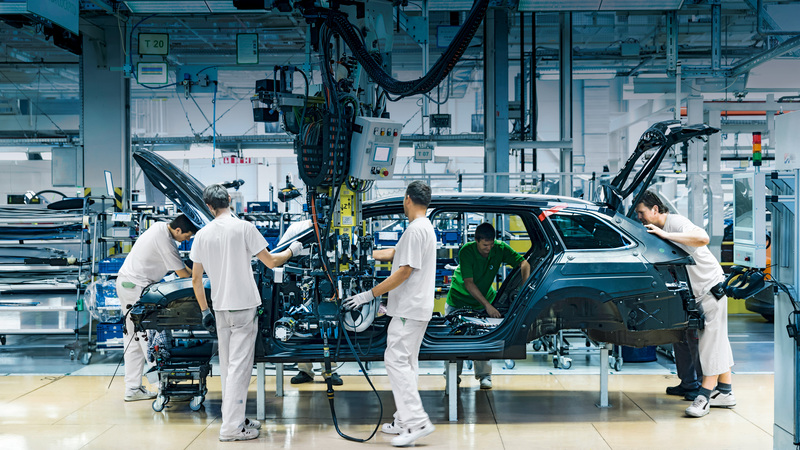 ŠKODA’s most recent production line was built in just one year. “That was like an awakening,” says production expert Tomáš Šípek with pride. “The new Superb has changed everything. The factory is now more generous, brighter, higher and wider – it’s ideal.” For both the Superb and the people who make it. 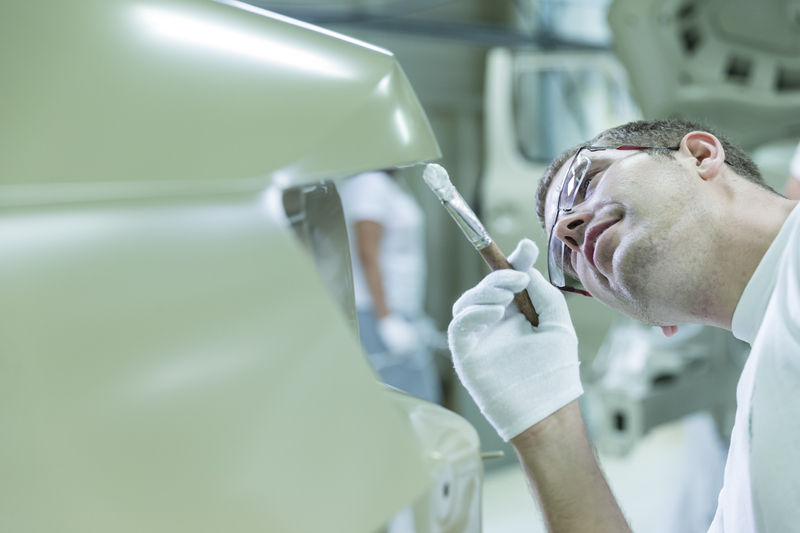 The finishing work on the body before it goes to the paint shop consists of yet another process that sounds simple but is actually rather complicated. Doors, bonnets and hinges are alternately adjusted from back to front. A camera is used to ensure precision when placing the tailgate into a position that the human eye can no longer discern. Tolerance levels here are just about zero, already ensured by in-house quality control that performs random ultrasound measurements during the ongoing production process. Martin Pražák (23) from Kostelec nad Orlicí concentrates on installing components in the dashboard. He has been at ŠKODA for five years. Every time production of a new model begins, the staff gain new experience and the process itself is improved. Pražák found it especially interesting to learn about new technologies in 2015 while working on the preliminary series in Mladá Boleslav. IT’S ­FASCINATING TO SEE HOW BRAND-NEW TECHNOLOGIES CHANGE OUR DAILY ROUTINES. One Superb per shift is completely removed from the assembly process and examined at a measurement and test centre designed specifically for this purpose. The room reserved for this fitness check has special security features. 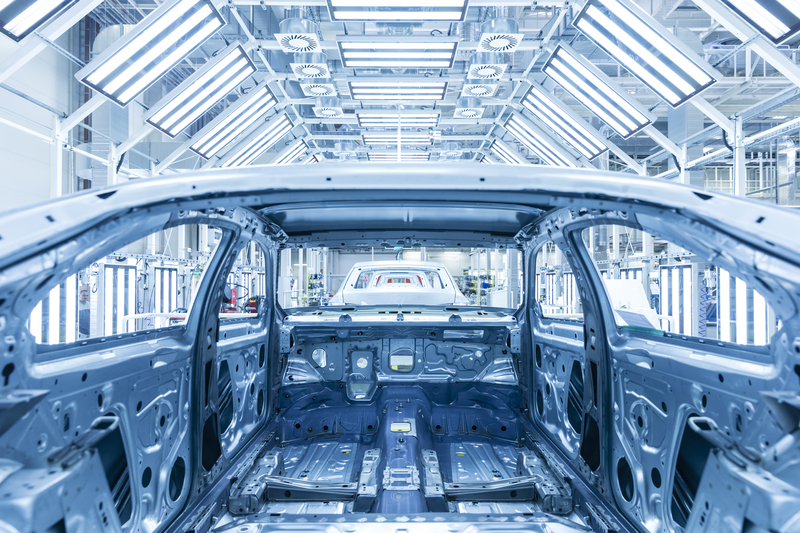 All the data needed for the constantly changing and improving automotive production processes of the future are gathered here. Insights that have a direct effect on adjacent linka, as the production line is called. One of the key moments in the life of a Superb is akin to a pit stop in Formula One. Speed and precision are crucial. This is the step that production specialists call the “marriage”, which joins the two main components of body and engine together. 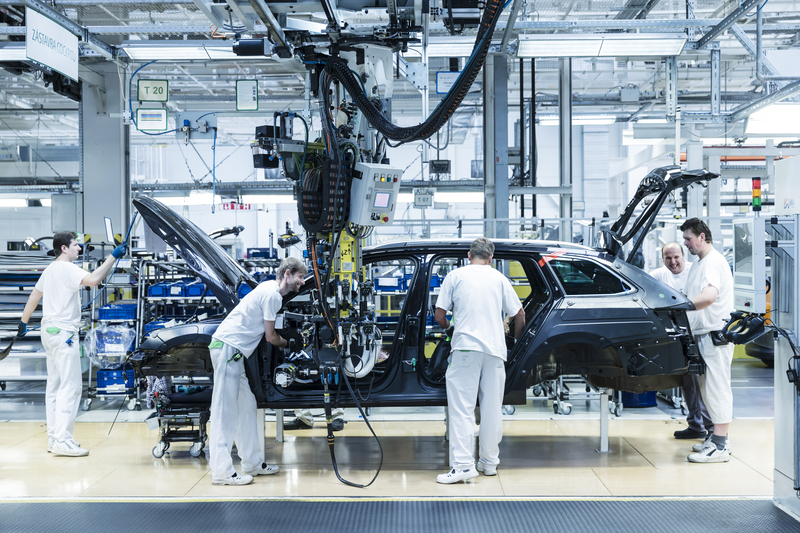 The body is elevated to approximately 1.80 metres in order to install the powertrain preassembled by Petr Barták and other operators. The Superb loses its single status in just two minutes of assembly – a shotgun wedding. And the process continues at roughly the same pace. The line weaves through the hall, but the principle remains the same. The components needed for installation are preassembled on the sides of the hall before being fed onto the line. Barcodes ensure that the correct dashboard will be assembled at the station operated by Martin Pražák. And the process keeps on going like a string of beads. Wiring harnesses are laid under the carpet, window regulators and windshield wipers are mounted, and the correct software is installed. The parts are brought in alternately by workers and by self-driving electric transporters. The latter announce their arrival with music – heavy metal, of course! Petr Főrster (29) from Kvasiny works as an inspector on the production end line. 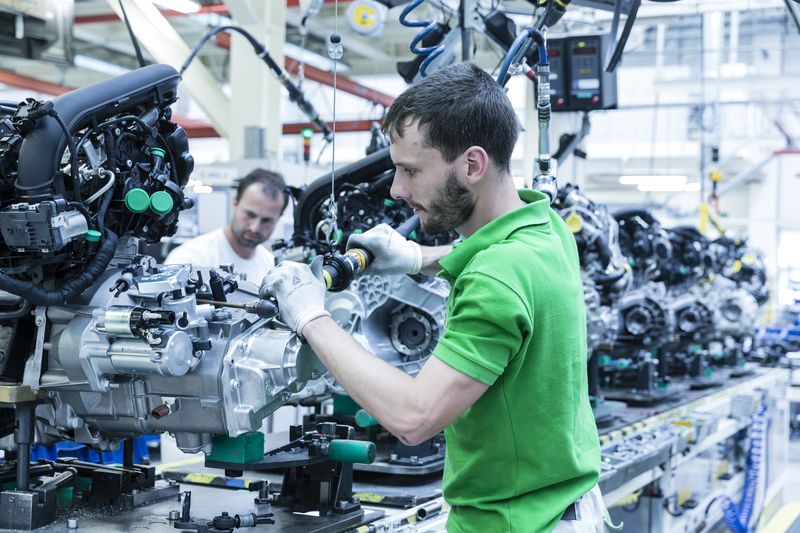 He has been at ŠKODA for nine years and values the opportunities for career development. For him, 2015 will be associated with the time saved in the production process. From here on, it gets really serious. This is the territory of strict inspectors such as Petr Förster. This is where the engine is started up for the first time. It is running! But does the car actually move? The first test drive is always a sublime moment. The car makes its way a short distance across the hall, then outside onto a warm-up course right next to the production halls, which includes an asphalt hill. No ŠKODA leaves Kvasiny without first having passed this functional test. The Superb now has all of the necessary genes. Its automotive life can begin. So too can the real driving fun. EVERYTHING IN KVASINY IS UNDERGOING FURTHER DEVELOPMENT, NOT JUST PRODUCTION. to continue undergoing expansion, with some €263 million to be invested by 2018. Photo: Andreas Pohlmann, Video: ŠKODA AUTO a.s.